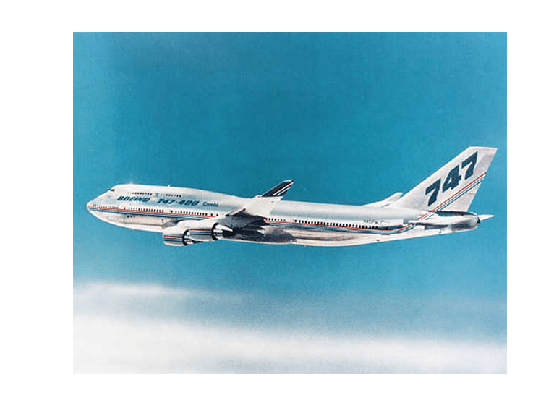 This example shows the design of a YAW DAMPER for a 747® aircraft using the classical control design features in Control System Toolbox™. 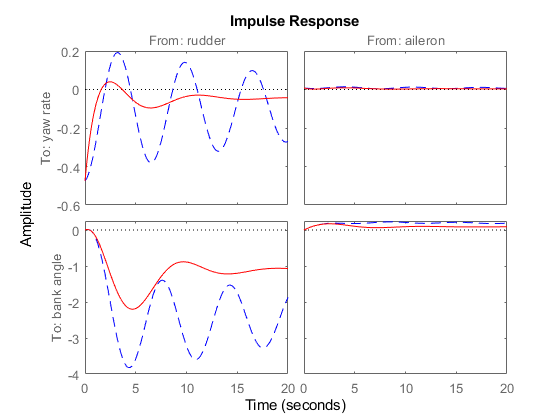 and two inputs: the rudder and aileron deflections. All angles and angular velocities are in radians and radians/sec. Right-click and select "Grid" to plot the damping and natural frequency values. You need to design a compensator that increases the damping of these two poles. 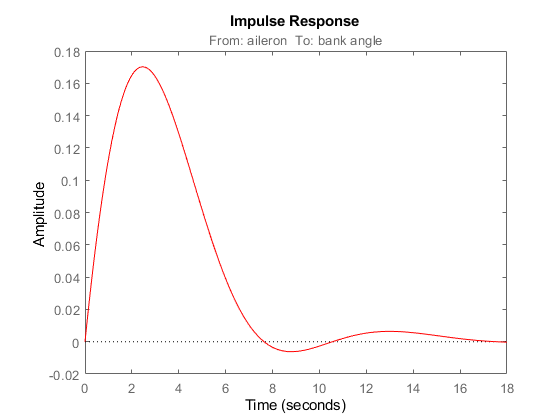 Look at the plot from aileron to bank angle phi. 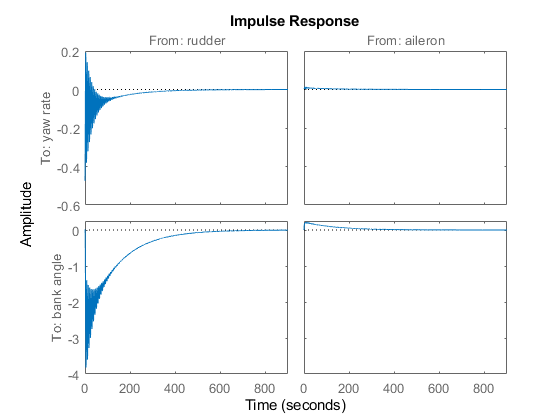 To show only this plot, right-click and choose "I/O Selector", then click on the (2,2) entry. 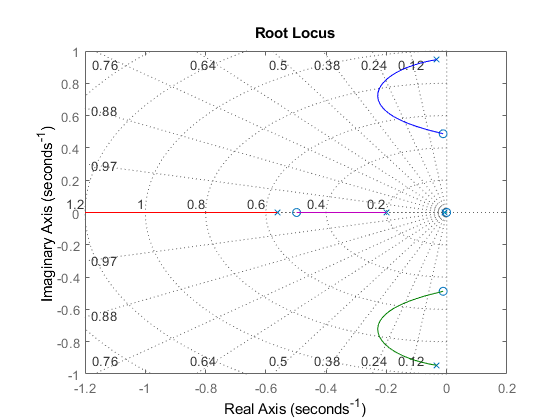 This plot shows the aircraft oscillating around a non-zero bank angle. 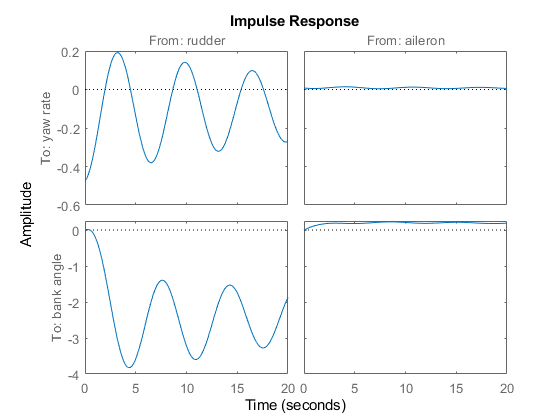 Thus the aircraft turns in response to an aileron impulse. This behavior will be important later. 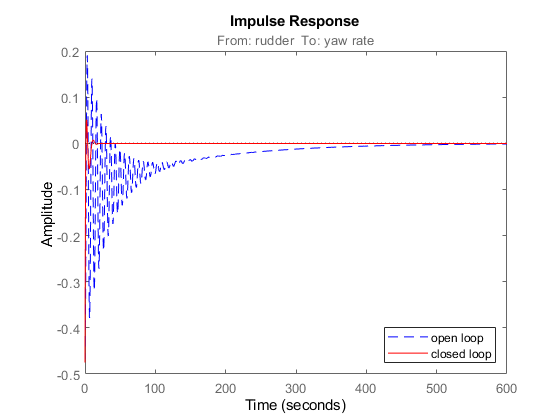 This plot shows that the rudder has a lot of authority around the lightly damped Dutch roll mode (1 rad/s). Oops, looks like we need positive feedback! This looks better. 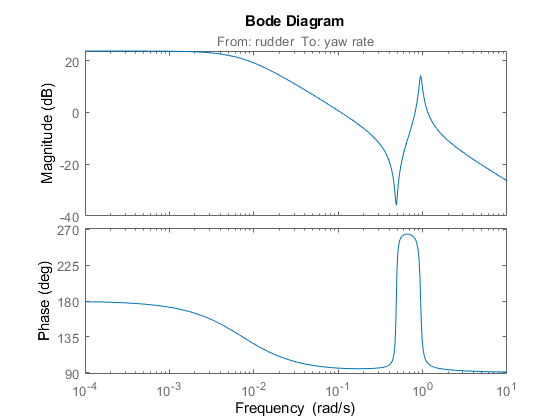 Click on the blue curve and move the black square to track the gain and damping values. 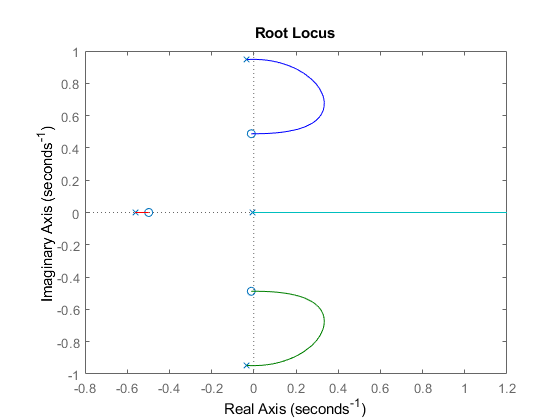 The best achievable closed-loop damping is about 0.45 for a gain of K=2.85. The response looks pretty good. The yaw rate response is now well damped. You have over-stabilized the spiral mode. 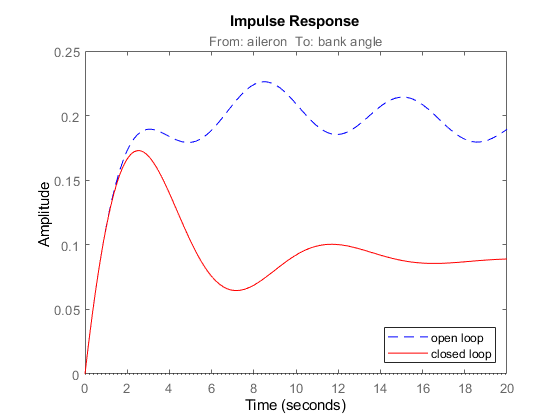 The spiral mode is typically a very slow mode that allows the aircraft to bank and turn without constant aileron input. Pilots are used to this behavior and will not like a design that does not fly normally. You need to make sure that the spiral mode doesn't move farther into the left-half plane when we close the loop. 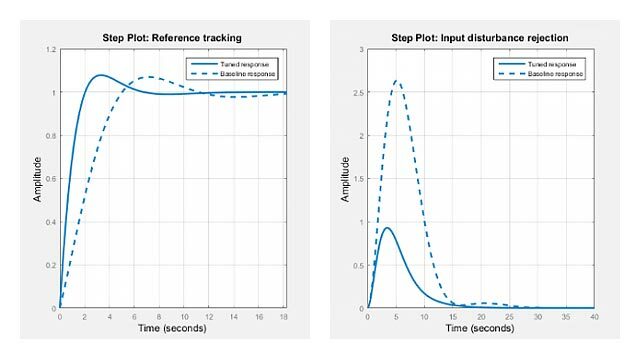 One way flight control designers have fixed this problem is by using a washout filter. 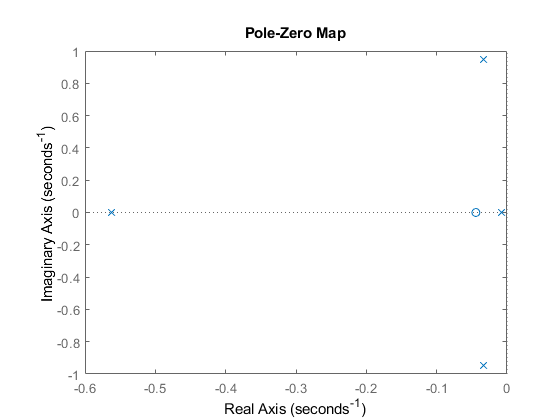 Using the SISO Design Tool (help sisotool), you can graphically tune the parameters k and a to find the best combination. 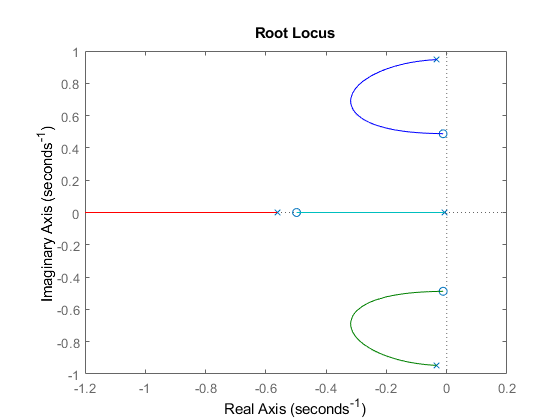 In this example we choose a = 0.2 or a time constant of 5 seconds. The washout filter has also restored the normal bank-and-turn behavior as seen by looking at the impulse response from aileron to bank angle. Although it doesn't quite meet the requirements, this design substantially increases the damping while allowing the pilot to fly the aircraft normally.